You might have come across the Infinite Monkey Theorem, or more likely, its popular variant: a million monkeys on a million typewriters will together eventually produce the collective works of Shakespeare (or any other author you fancy). Looking at the way Microsoft is trying to promote the creation of new apps for its upcoming Windows 8 OS, it would seem that the theorem applies to code monkeys as well. 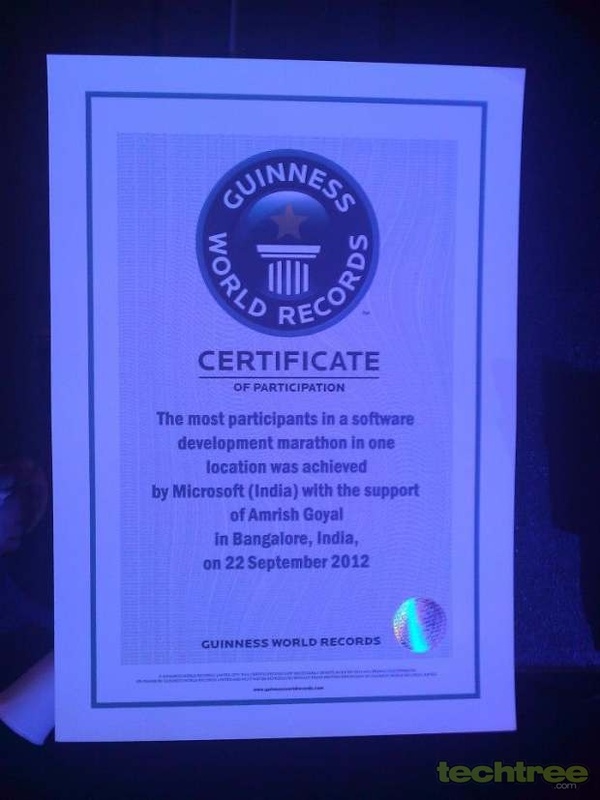 Over the weekend, the Windows 8 AppFest came to a successful conclusion at Bangalore, creating a Guinness World Record for the maximum number of developers participating in an extended coding session under one roof. Considering that India is the IT labour capital of the world, if MS was looking for sheer numbers to aid in its mission, it couldn't have chosen a better place. The event began on the morning of the 21st with registrations at 0900 IST. Once the formalities were completed, the keynote speech was delivered at 1330, and the programming session officially kicked-off at around 1500 hours. In his address, Bhaskar Pramanik — Chairman, Microsoft India spoke about the development opportunities that Windows 8 would present to the 1.2 million strong coder community in India — second probably to only the Chinese, if at all. Since the preview of Windows 8 to developers last year, about 750 such events have been conducted in over 50 countries, but this was the biggest single event with over 2500 developers in attendance, along with Microsoft engineers and design specialists. The 18 long hours were not meant just for coding, as the theme of the AppFest was "Eat. Drink. Code". While the "Drink" part of the event was sadly limited to non-alcoholic beverages, there were plenty of other distractions, including a set by DJ Rink, a performance by Swarathma, and a magic show to boot. The music kept playing through the night, with a mix of slow and pumping tracks to help keep the participants going. The next morning saw instructors from the Art of Living course conducting a session on stress relief to help relax participants. When the dust settled after 18 long hours, Paul O'Neill — Vice President, Guinness World Records, announced that the record attempt was successful, with an official figure of 2567 participants. Each participant received a Certificate of Achievement for their efforts, and everyone went home happy. As for the Infinite (Code) Monkey Theorem? Once the apps made in the event have been released in the upcoming Windows Store, we'll know if the result of this coding jamboree was pure chaos or download-worthy apps. In any case, with MS taking a serious interest in the Indian app scene, and Google now allowing developers from the country to publish paid apps in Google Play, it would seem that opportunity has indeed come knocking on local app makers's doors.